For students of Astrology the most difficult thing is to decide what are the essential aspects of a particular chart. There are so many symbols and possibilities to consider that its difficult to get the weighting right. There are many articles that astrologers have presented where they will explain a certain trait in a person’s life by digging up the most obscure symbol. They might be trying to explain their subject’s interest in alcohol by looking for a Piscean reference where there are no planets in the sign or the 12th house and Neptune has no aspects at all but will assert confidently that its caused by Pisces being on the cusp of the 6th house or some such nonsense. Some will use Fixed Stars of which there are obviously billions or asteroids and even invented symbols that are supposed to exist in a certain space and others will use midpoints between planets as part of their interpretation in a desperate bid to find something that backs up what they want to say. Every practitioner has to find their own way with this wonderful subject but Capricorn Research firmly believes that the more options we give ourselves in terms of the number of symbols that we are prepared to use for our ends the less credibility astrology has. If we allow ourselves to use anything to explain our observations we are opening ourselves up to precisely that sort of criticism. There are so many sceptics out there that we don’t need to give them more fuel for their arguments. Why not just stick to the basics, if there is something that can’t be explained by this method perhaps we should just admit that. Capricorn Research’s sole aim is to convince people that the subject works and this is best achieved by sticking with a relatively small number of symbols and proving that they deliver consistently. Really the essence of a chart and therefore a life should be covered by a comprehensive understanding of the sign and house positions of the Sun and Moon, the Ascendant’s sign and any major aspect patterns. This simple sticking with the basics is even more important when it comes to transits. Many people with a little knowledge will confidently state that profound life changing circumstances will occur to them because there is a Full Moon coming up. This prognostication is delivered despite the fact that the Moon in question has no angular contact whatsoever to any feature in their own chart and also that its influence can only last for a matter of hours or a day at most. The Capricorn Research method for transits is to stick almost entirely with the movements of Pluto. These have demonstrable effects in terms of measurable events but they also have the advantage of lasting for up to 2 or 3 years thus having enough time to mark major changes in a person’s life. As it moves so slowly Pluto can only generally make one transit to the Sun and another to the Moon in a lifetime so if one of these coincides with the turning point in a persons life we can be sure that our observation has scored a hit. If astrologers really have any intention to demonstrate an influence that can be tested and measured, so many of the factors used should be dropped like a stone. Best to go ” back to basics ” as former Tory Prime Minister John Major famously said but then of course he would as he had the Moon rising in Capricorn. There are times however when an important theme does come up that is just slightly outside of this rather narrow remit so we need to be aware of other possibilities as well. One area that needs to be considered are any extremely close aspects between planets that don’t form a major pattern or relate that strongly to the Sun, Moon or Ascendant. An example of this sort occurs in the chart of novelist Joseph Conrad. Conrad is regarded as one of the greatest novelists who wrote stories often with a nautical setting, that depict trials of the human spirit in the midst of an indifferent universe. He began his career in the merchant navy. After nearly four years on French ships, he served the next fifteen on a British boat as a steward, apprentice, able-bodied seaman and then as third, second and first mate, until eventually achieving captain’s rank. Most of Conrad’s stories and novels, and many of their characters, were drawn from his seafaring career and persons whom he had met or heard about. Now its actually true that we can get all this information from a quick glance at his Sun and Ascendant signs. Sagittarius is the sign of the traveller and Gemini of the writer and the fact that these two points are linked by an opposition aspect shows the two powerful pulls in Conrad’s life. Looking further we can see that the Sun’s only aspect is the square to Neptune in Pisces which simply shows us that his means of travel was by sea. You could hardly ask for a clearer symbol of a merchant seaman than Sun in Sagittarius square Neptune in Pisces. This would be enough, job done, Joseph Conrad covered simply by the Sun, Ascendant and Neptune. But if we look just a little further we can find something that ties him down even more. The Sun is conjunct Mercury, the planet that rules written communication and Mercury is in exact conjunction with Neptune. In fact Mercury in Sagittarius square to Neptune in Pisces sums up Conrad’s life better than the Sun square Neptune, because it includes the writing. In 1894, aged 36, Conrad reluctantly gave up the sea, because he had become so fascinated with writing that he had decided on a literary career. His first novel,” Almayer’s Folly “, set on the east coast of Borneo, was published in 1895. That this was the turning point in his life was clear from Pluto’s only aspect to his Sun, the opposition in 1894 – 6. Pluto’s only aspect to his Moon was the conjunction in 1924 when he died. So again if we left it there we would conceivably have had the two main turning points in Joseph Conrad’s life, but we would still be missing something. If we focus on the Mercury /Neptune aspect we see something else. Conrad’s most famous novel, ” Heart of Darkness ” was published in 1899 when Pluto was opposite Mercury and square Neptune. And 80 years later, over 50 after Conrad died, Neptune finally moved round to 19 degrees Sagittarius in conjunction to his Mercury and Heart of Darkness was turned into the film ” Apocalypse Now “. If Joseph Conrad had still been alive, this would have been a big thing for him, not least in royalties. It was massive thing for the film’s director, Francis Ford Coppola who had Pluto opposite his Sun at the time. Coppola had the Sun in Aries square Mars and the Ascendant in Capricorn. Of course Coppola’s real breakthrough was with the Godfather and Godfather Part Two in 1972 and 74. The Sun in Aries square Mars rising in Capricorn is a perfect symbol for the Godfather and for the gratuitous violence ( Sun in Aries square Mars ) of organised ( in Capricorn ) crime. 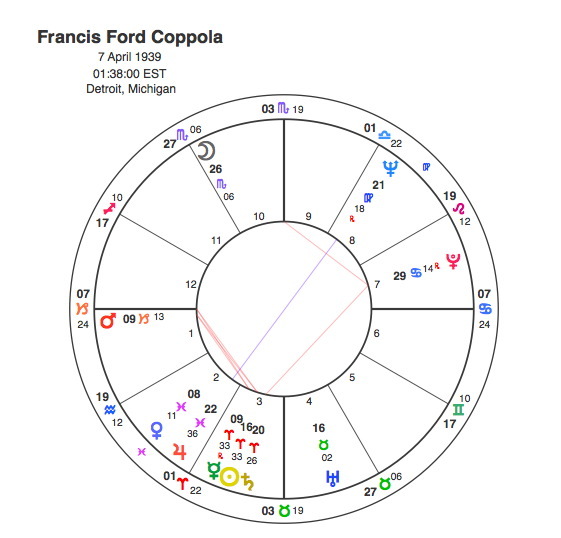 But in the extraordinary way that Astrology has of throwing up things that most people would believe is coincidence, a closer look at the chart reveals Mercury doing exactly the same thing to Coppola’s Sun / Mars as it had to Conrad’s Sun / Neptune. Mercury is at 9 degrees Aries in exact square to Mars at 9 Capricorn. And Pluto transited to this aspect as Coppola scooped the Oscars in 1974-5 becoming only the second director to win three of them for the same film. In fact coincidences are not what they seem. Things coincide because they are meant to, astrology sees to that and chance doesn’t enter into it. 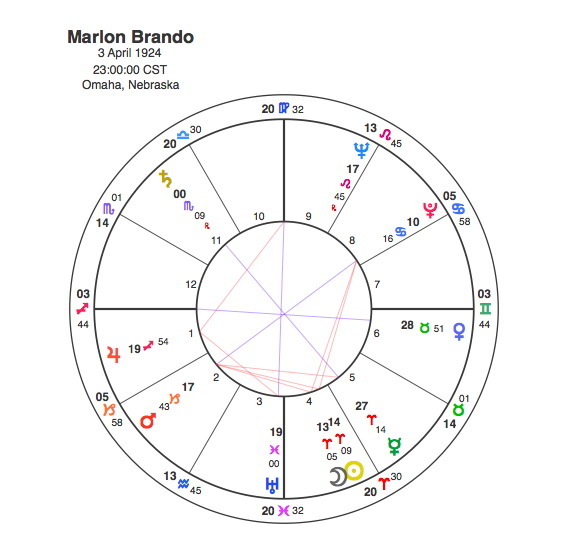 If you’re not convinced of that try looking at the chart of Marlon Brando, star of the Godfather and Apocalypse Now. Like Coppola, Brando also has the Sun ( and the Moon ) in the middle of Aries in square to Mars so its only natural that he would be Coppola’s star. And Pluto was doing the same thing to him during the filming of Apocalypse Now, opposite his Sun and square Mars. This was obviously not be the great man’s big breakthrough but perhaps a sign that he could still cut it in his mid fifties. If we stick to looking at the Sun and Moon aspects for the main themes in a chart we can’t go far wrong but sometimes it pays to have a look at Mercury too. Mercury of course is always floating around the Sun and often gets so close that it can’t really be considered as a separate entity. But the Joseph Conrad’s Heart of Darkness shows us that its exact aspects have to be looked at, otherwise we will miss something significant. So the moral of this story is to stick to the basics whilst keeping an eye open for extremely close aspects that give you another handle on things, but you can still shove your midpoints where the Sun don’t shine.